Blessings, Miracles, &Thoughts in Between: Transplant Day! Today is officially day +6 and Will is having a pretty hard time. I hope to be caught up with what's been going on over the past week by the end of this week but for now we are asking for prayers for comfort for Will. He is battling mucousitis (the worst being in his throat, esophagus right now) which has him very miserable. 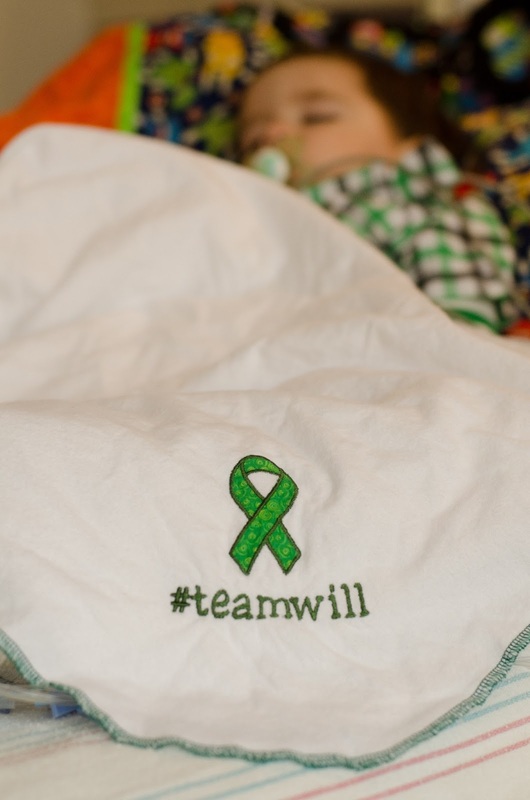 Last Wednesday, June 12, was Will's transplant! His cells arrived in Houston the night before and spend hours in the processing lab. Will and his donor are different blood types (Kate and Lance were also different blood types!) so all of the red cells had to be removed from the marrow before Will could receive it. We were expecting a 1pm transplant time but, things ran a bit behind that day! Wednesday morning Kate was able to visit for a little while! We broke the visitation rules (only two people total by a patients bedside) so that we could get a family picture of the big day! Thankfully the nurses allowed us to get a picture before Alex left Wills room! Will has all new toys in his room and Kate was absolutely amazed when she walked in and saw them all! She kept saying "oh my bubba you have so much cool stuff here! Yet's pay wif it all!" So they did just that! Ashley (the owner of SheShe Made) sent Kate a special transplant day outfit! 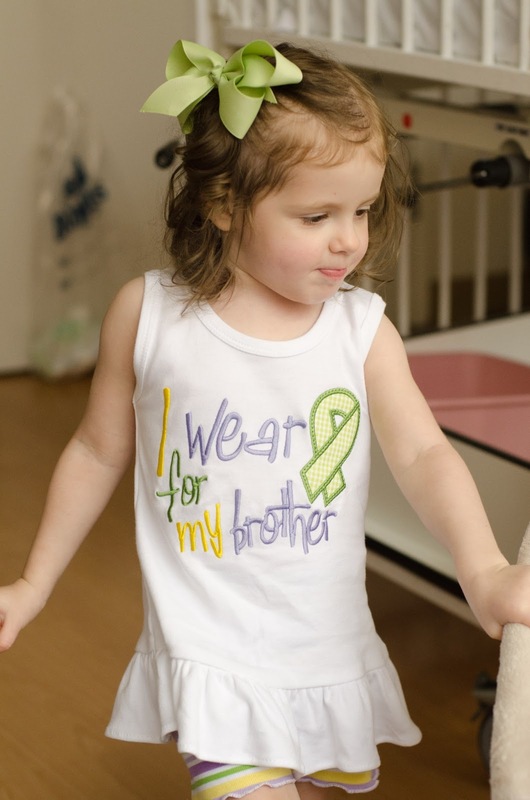 I absolutely adore it and love that Kate was able to show her support for bubba! Before Kate left, she gave Will one last hug and kiss and told him to be brave. She has been so sweet to him and is so concerned about her brother. Always asking how his ouchie is, loving on him, and telling him he will get all better! They have such a special bond. While we waited for Will's cells to arrive on the floor we took lots of pictures!! He was in a great mood which made the wait much easier. Right before Will received his premeds he got sick to his stomach which resulted in an outfit change. Thankfully I had lots of green packed so he was still able to wear his green! 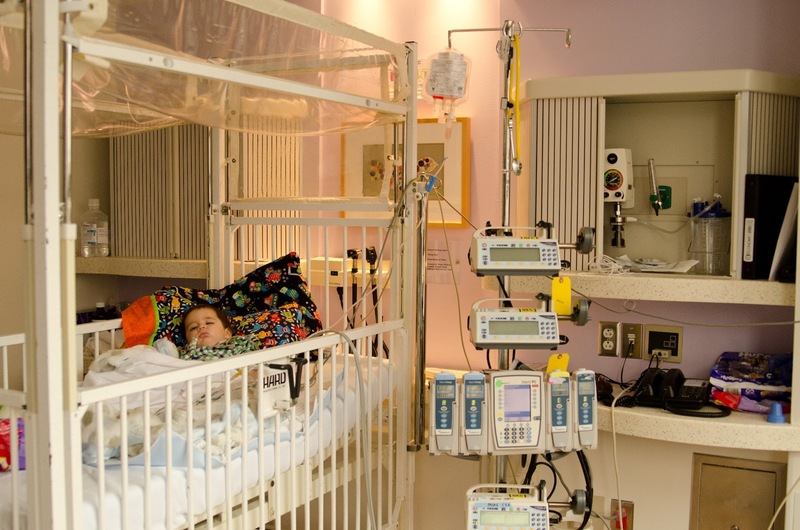 As soon as his premeds started (Benadryl, Tylenol, and something else I believe), Will passed out and ended up sleeping through the entire transplant! As I've mentioned before, a bone marrow transplant is similar to a blood or platelet transfusion so it occurred in his room. The first thing I noticed when I saw the bag of cells was how light colored they were. Apparently there is a new technique used to process/ remove red cells that was not used in 2011 when Kate received her cells. This new process allows for way more red cells to be removed from the marrow! We had wonderful nurses present for Will's transplant. 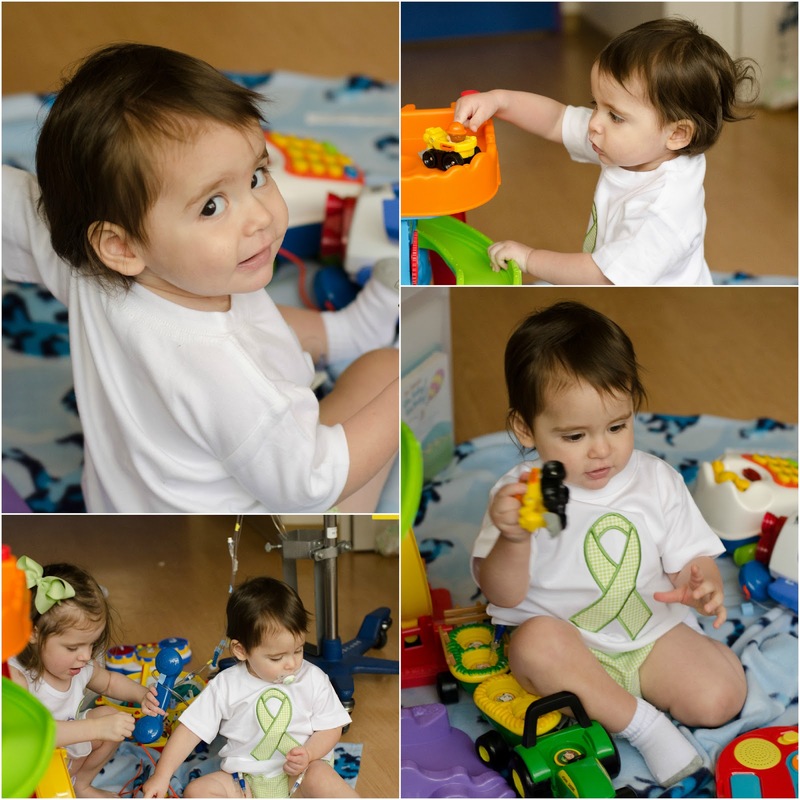 Tania and Lauren are fantastic and I am so thankful they were able to be the ones to give Will his new cells! Will loves all of his nurses but I think Miss Tania holds a special place in his heart! 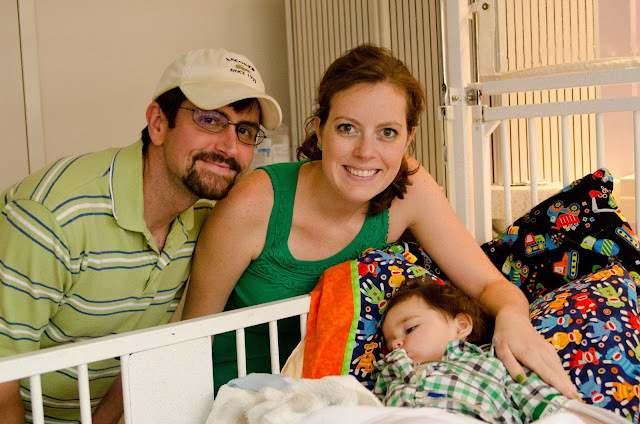 At 3:44 CST the first of Will's new, life saving cells reached his body. 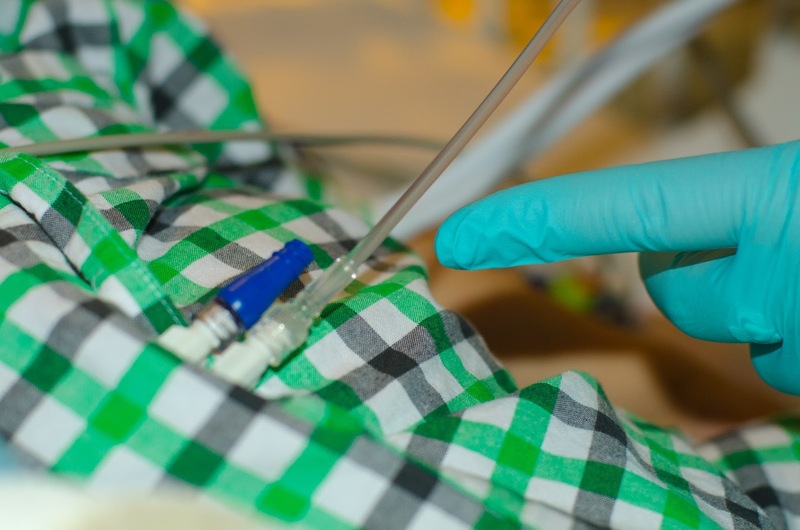 The cell infusion took about two hours - which was double the time it took Kate to receive her cells. 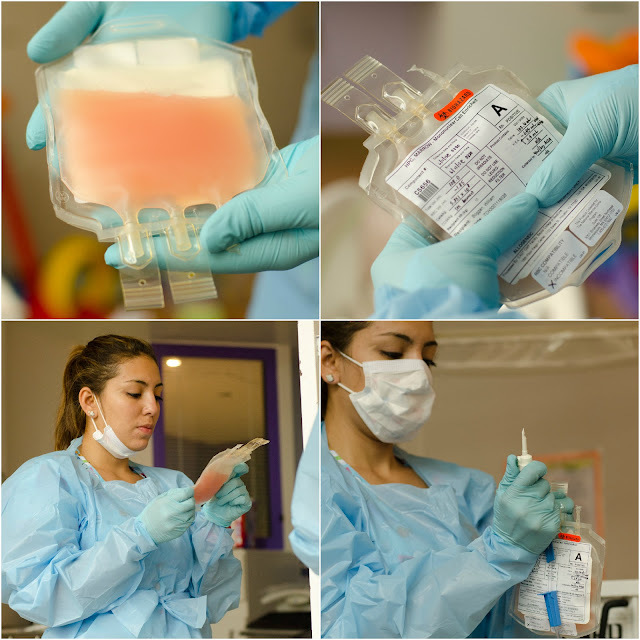 Marrow cells are transfused without any type of pump/ pressure component in order to limited damage to the cells. Gravity is the only thing that aids in the flow! 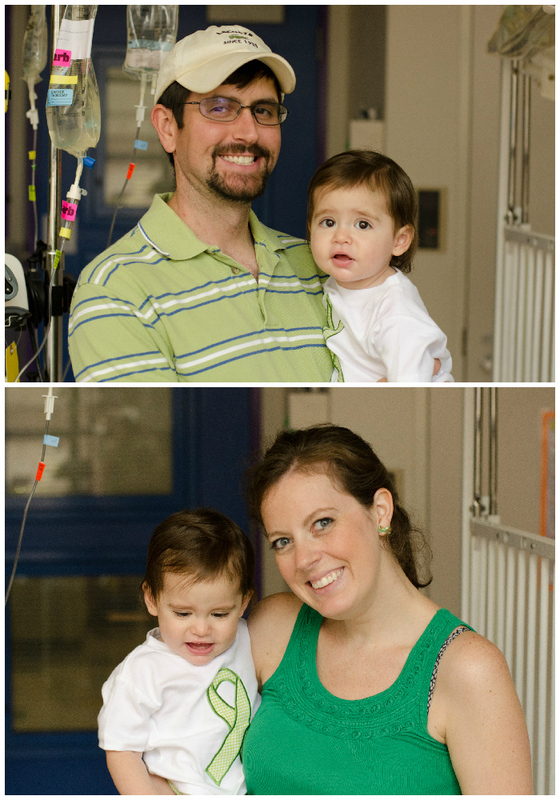 I've blogged about it before but the actual transplant is very anticlimactic. It is very emotional to witness but medically, it is relatively easy. It was so easy on Will that he just slept through the entire thing! Ha! Going through this process for the second time was equally emotional but different at the same time. We knew what to expect, we know what a full recovery is like, we have witnessed failures. We are just in a very different place than we were when we sat three doors down on August 31, 2011. Despite any differences, we were still completely overcome with gratitude for the donor that has given Will a second chance. June 12 will forever be a monumental day for our family. Not only did Will turn 14 months old, he also celebrated his re-birthday! 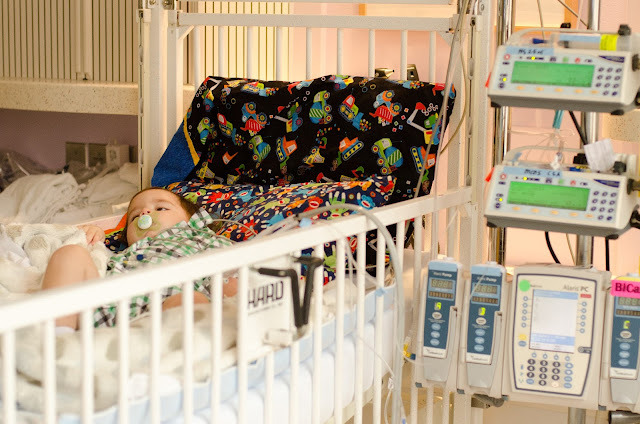 We've got a LONG and HARD road ahead but we are praying the Lord will bless Will, bless his new cells, and allow him to recover and live a long, healthy life! I have been praying for your sweet family and was so glad to see an update. I have spent the last few days reading your blog from beginning to present. My friend Kim H. placed a prayer request for Will on FB a number of days ago with a link to your blog. I came over read the post and then went back and read them all. I am the mother of two girls, 19 months apart. Anna (2 yrs, 3 mo) and Kate (8 mo). Clearly we have a Kate in common. Anyway...I just wanted you to know, that I pray for Will and your family everyday now...and for the record, I think you are amazing. 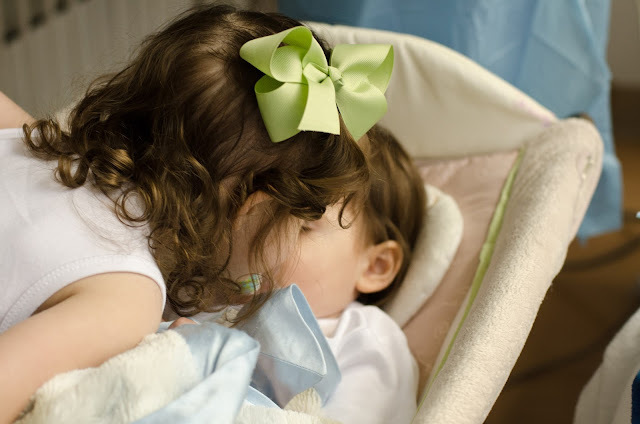 As moms we love our children and whereas I know you have your moments as you have mentioned, I think you are more than just a mom to those precious babies. Godspeed on your journey...I will continue prayers for you guys as well as your donors!